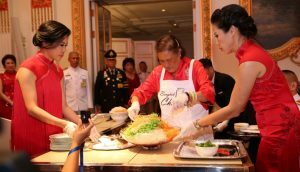 Bangkok (Thailand) – February 11, 2019 (travelindex.com) – Her Royal Highness Princess Maha Chakri Sirindhorn presided at the 10th edition of the Bangkok Chefs Charity Fundraising Gala Dinner featuring an 11-course gourmet menu crafted by twenty-two top chefs from five-star hotels in Thailand and Thai Airways International using the finest quality imported products, pesticide-free vegetables from ‘Jan-Ka-Pak’, Camellia Seed Oil from ‘PatPat’ amongst others, successfully raising a grand total of 44 million baht during the evening’s highlight fundraising session at Mandarin Oriental, Bangkok recently. The amount also includes donations raised from the auction of ‘Pagakayaw Shawls’ from the royally-initiated Phufa Shop. This culinary charity event of the year is organized by Gourmet One Food Services Co., Ltd., Thailand’s leading importer of premium food products, led by sisters Nuntiya Intralib and Patcharin Hame-ung-gull. The entire amount raised, without any deductions for expenses, will be presented to Her Royal Highness to benefit the Border Patrol Police Schools under the patronage of Her Royal Highness, and located in remote areas of Thailand. The highest contributor to this year’s fundraising, conducted by emcees Surivipa Kultangwatana and Varin Sachdev, is once again Mr. Prayudh & Mrs. Suvimol Mahagitsiri who pledged 15 million baht. Other prominent donors are: Ms. Nualphan Lamsam (5 million); Mr. Harald Link of B. Grimm Group (5 million); Mr. Thanawat Trivisvavet, CK Power Co., Ltd. (5 million); Ajarn Wanchai Ruay-are (4 million); Mr. Anun Raweesangsoon (2 million); The White Space Co., Ltd. (2 million); M.R. Sasijuthapa Worrawan (1 million); Mrs. Botan Hame-ung-gull (1 million); Mrs. Benjawan Buhrman (500,000); Ms. Orawan Taechaubol (200,000); Ms. Srisopha Kotkumlue (200,000); and Mr. Noppadol Intralib (100,000). Auction of the “Pagakayaw Shawls” from Phufa Shop were successfully bid by the following distinguished guests in attendance amongst others: Mr. Chalermchai Mahagitsiri (500,000); Ms. Usanee Mahagitsiri (150,000); Mr. Laurent Leonio (150,000); Ms. Sasiprapa Deerod (250,000); Mrs. Benjawan Buhrman (200,000); Ms. Poramin Netrpukkana (150,000 baht); Mr. Pinit Puapan (120,000); Ms. Piyanuch Raveesangsoon (100,000); Ms. Patcharin Hame-ung-gul (100,000); Ms. Nuchanart Raveesangsoon (100,000); Mr. Boonchai Chokewattna (100,000); Ms. Suthama Gimsong (100,000); Mr. Vikrom Sachdev (100,000); Dr. Somsak Chalachol (50,000); Dr. Alisa Kunchornyakong (50,000); Ms. Srirach Thanarach (50,000); Ms. Racha Sukum (50,000); Ms. Pensiri Na Nakornpanom (50,000). As this year’s event coincided with Chinese New Year, Her Royal Highness prepared the “Yee Sang” Prosperity Toss Salad and presented a plate each to all the generous participants of the fundraising session for abundance, prosperity and vigour in the year of the Pig. Krungthep Light Orchestra and solo-pianist Darin Pantoomkomol provided live entertainment throughout the evening. And Central Wine Cellar supported the gala dinner menu with a selection of the finest wines.